Mayor Martin J. Walsh said Wednesday night he will seek reelection to a second term in 2017, and he would not rule out a run for higher office. Walsh enjoys high approval ratings and has said he hoped to serve at least two terms, but he had not previously made a public declaration. Responding to a question at The Boston Globe interview series at Suffolk University, Walsh made it clear. Asked if he will parlay his popularity into a bid for state or federal office, Walsh demurred and said, “I don’t know.” What gives him pause, he suggested, is the heightened scrutiny of a larger political stage. During the 45-minute interview, Walsh offered a candid and at times intimate account of his first 20 months at City Hall. He spoke about his Catholic faith, his sobriety, and the impact his political rise has had on his mother, Mary Walsh, who emigrated from Ireland at age 17. Mayor Martin J. Walsh spoke with Globe reporter Joshua Miller at Suffolk Univeristy for the Globe’s Political Happy Hour. His proudest day in office came Monday, Walsh said, when his mother was greeted by President Obama with a hug. Mary Walsh was so overcome, the mayor said, that she left the room and cried. The mayor spoke at length about grappling with the scrutiny he has endured as mayor, and struggling to maintain a private life. When he was a state representative, Walsh said, he could throw on a baseball hat and enjoy life with anonymity. But as mayor, Walsh cannot set foot outside his home without being recognized. He rarely gets to drive. His private life often ends up in the press. In his bid for a second term, Walsh does not — as of now — have significant challengers looming on the horizon. He has proved a prolific fund-raiser and the power of his office makes incumbency particularly potent. A sitting mayor of Boston has not lost an election in more than 60 years. Walsh’s predecessor, Thomas M. Menino, served 20 years without a close race and ran for his second term unopposed. But with more than two years until the election, challengers could materialize. Walsh stoked grassroots opposition in his failed bid to host the 2024 Summer Olympic Games. Walsh acknowledged that he lost some friends in his pursuit of the 2024 Olympics and said he felt a tinge of regret when the Los Angeles City Council voted to bid on the Games. He touched on several public policy issues. He said that he wanted the city to have a role regulating the ride-sharing service Uber, the same way it oversees taxis and livery car services.He did not say whether he supported body cameras for all police officers but said the city is launching a pilot program to gauge the impact. 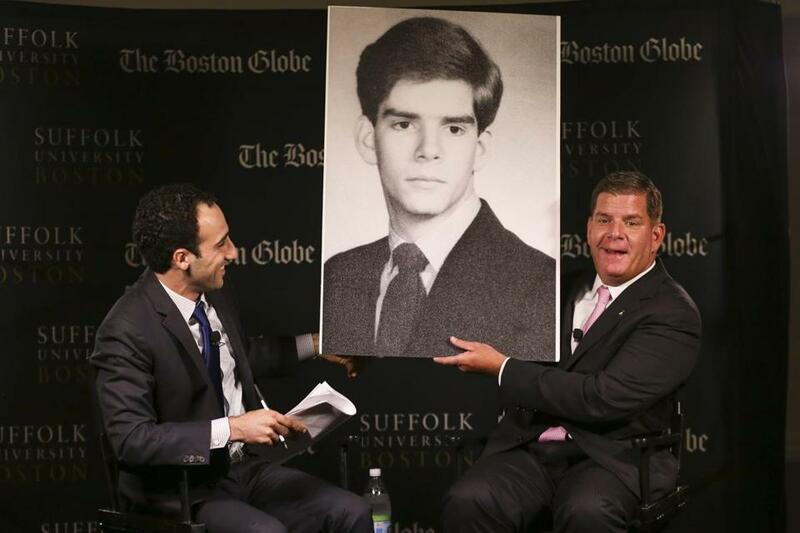 Mayor Marty Walsh reacted to a enlarged photograph of himself from his youth during an interview at Suffolk University. As the city launches a study of Boston’s aging public school facilities, Walsh said that some schools could merge and others could close. The mayor vowed to give new Superintendent Tommy Chang autonomy to run the city’s public schools. Chang is “100 percent committed” to Boston, Walsh said, even though his family has remained in California. When asked, Walsh said that he never formally thanked the American Federation of Teachers after it spent a half-million dollars on television advertising on Walsh’s behalf in the final throes of the 2013 mayoral election. The union’s role remained anonymous until after the election, and some credit the push with helping Walsh win. The mayor rejected the suggestion that the commercials put him over the top. Walsh maintained his neutrality in a potential Democratic presidential primary fight between Hillary Rodham Clinton and Vice President Joe Biden — who has not yet decided whether to run — but the mayor said he would endorse a candidate before the end of the year. The mayor discussed his close relationship with Republican Governor Charlie Baker but said that the two men have stayed away from controversial issues. Walsh, who is a Democrat, said he has never endorsed a Republican but he did not rule it out. Walsh also acknowledged that to regain a semblance of his private life he occasionally gives his security detail the slip to spend time away from the office. He has tried, he said, to not take criticism personally even as he scrolls through heated comments on his Twitter feed at night. Walsh said he has tried to remain grounded and said he hopes he is the same man he was before he took office. But even after nearly two years in office, he still spoke with a mix of reverence and awe that he is mayor of Boston.